This is the perfect salad for your Fourth of July celebration or any summer cookout or gathering. 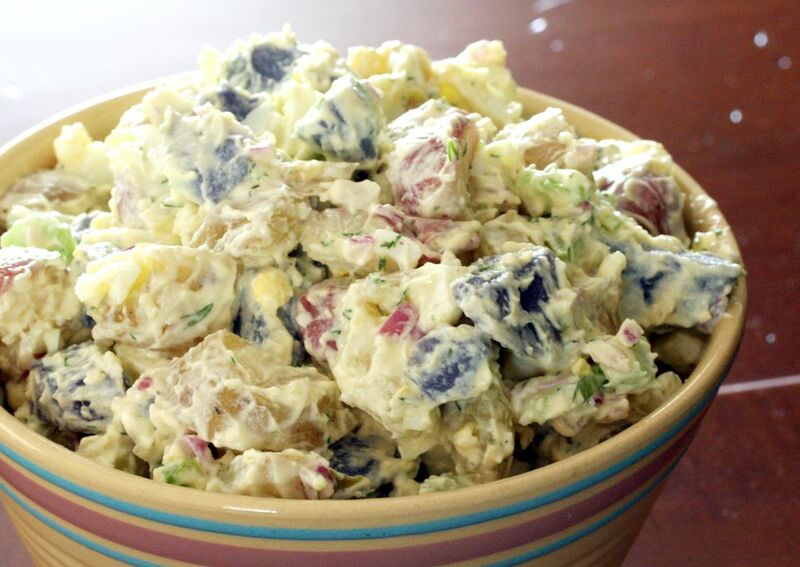 Small firm potatoes and chopped hard-boiled eggs make this a delicious potato salad, and the colorful potatoes make it attractive and festive. This version is made with a combination of mayonnaise and sour cream. Chopped fresh dill and dill relish flavor the dressing perfectly. Feel free to use new potatoes or all one color if you prefer. Scrub potatoes and trim any bruises and other imperfections. Cut into 1/2- to 1-inch pieces. Rinse the potatoes and put them in a saucepan; cover with water and add 1 teaspoon of salt. Bring the potatoes to a boil. Reduce the heat to medium-low, cover the pan, and continue cooking for about 15 minutes, or until fork-tender. Drain and let the potatoes cool slightly in the pan with the cover ajar. In a large bowl, combine the warm or cooled potatoes with the diced celery, chopped egg, and onion. In another bowl combine 3/4 cup of the mayonnaise with the sour cream, dill, dill relish, pepper, and salt; blend well. Gently stir the mayonnaise mixture into the potato mixture until the potatoes and vegetables are coated. Add more mayonnaise, if needed. Potatoes will absorb more of the dressing if they're dressed while still warm. New potatoes, red-skinned potatoes, round whites, and other waxy potatoes hold their shape well when they're cooked, making them the best choice for salads.